Four members of the Bryn Hedydd Termly Times newspaper team along with a very excited Mrs P-G, were lucky enough to go down to the Pavilion Theatre in Rhyl today and interview 3 members of the boy band The Wanted, currently at number 3 in the charts with their Comic Relief Single 'Gold Forever'! 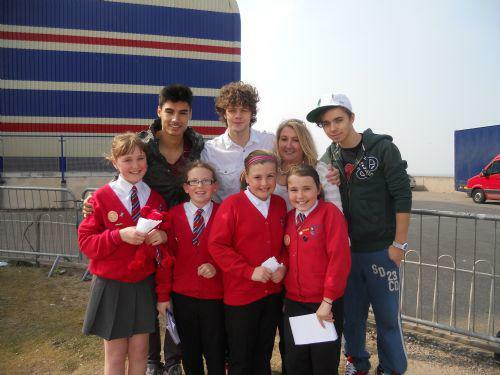 Band members Jay, Siva and Nathan took time out of their busy schedule to come outside and chat with the girls for twenty minutes, where they not only answered all of our questions but they posed for photos and signed autographs too! Of course, Dafydd was also lucky enough to meet the boys!!! They loved him so much, they have now been given their very own Dafydd, complete with Bryn Hedydd tie, to take on tour with them. Watch this space for the full interview!! Jay.... who thought Dafydd was "a Legend!!" Siva..... about to jump the railings! Eleanor.... same name as Jay's sister he told us! Yes Mrs P-G, we know you love them too!